Lola Teodora? Or Lola Lucia? I attended a Magno Family event over the week-end; and as expected, I managed to sneak genealogy talk into the conversation. My Tita Chody mentioned that their paternal grandmother (also her tukayo or namesake), Teodora Sobrepeña-Magno, died in 1969 in Iloilo. This bit of newly-unearthed information was enough for me to start a targeted search through Iloilo’s records. 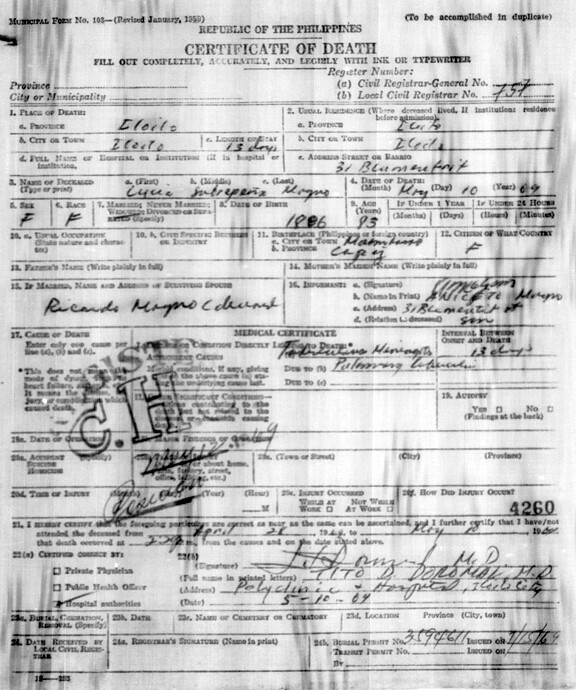 I accessed microfilmed death certificates for 1969 and found a lady named LUCIA Sobrepeña-Magno. She was born in 1886 (Check! That’s a good match for Teodora) in Mambusao, Capiz. She died on 10 May 1969 (Check!) 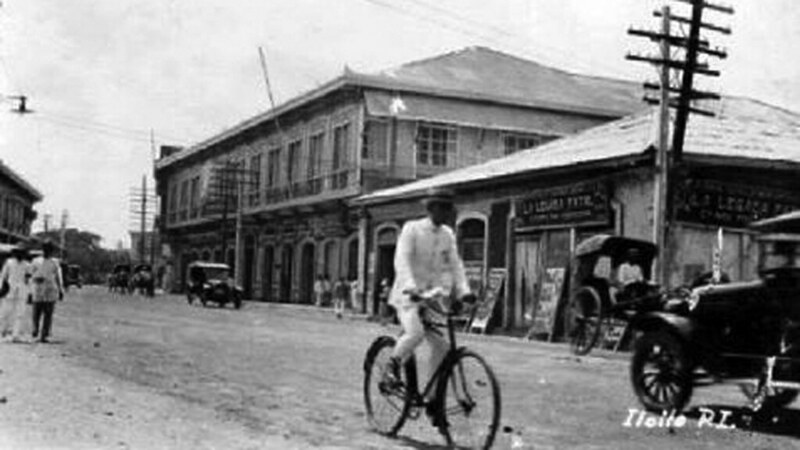 in Iloilo of tuberculosis. Her husband was Ricardo Magno (Check!). This woman had three crucial items in common with my great-grandmother. But is she the person I am looking for? 1) It is possible that “Lucia” is one of two given names. 2) Another possibility: a staff member at the Family History Center in Quezon City also posed that during this woman’s lifetime, it is common for rural people to change their given names mid-life. This occurs when someone is sickly or is plagued by ill-luck. They believe that changing their name will bring improved health and happiness. This was the case with this gentleman’s mother-in-law. I called my father (the eldest grandchild) and asked about this new first name. He did not believe it was the same lady as she was addresed as “Lola Doring” until the last decade of her life. The clincher was the name of the informant. It was Aniceto Magno, her son. My father vaguely remembers a story of my great-grandfather having an illegitimate child named Aniceto. The juicy question that plagues me now, if we go with the illegitimacy angle, is: Why does the my great-grandmother share a surname with her husband’s mistress? Were they related? I was unable to finish the microfilm as it was difficult to read and I was nursing a head ache the size of Utah. I will have to wait until Tuesday next week to review the records again to get another crack at finding Teodora. My Tita Inday called her older cousins in Iloilo — they are in their 80s — to ask about Lucia and Aniceto. It turns out that my great-grandfather, Ricardo, got her wife’s niece (the daughter of Teodora’s brother) pregnant. While my great-grandmother Teodora remarried (so her last name changed since her husband’s death in the 1930s), Lucia never did (which was why she used her “Magno”). With the “ew” reflex contained, I am looking forward to a trip to Iloilo to dig up more stories. I can smell the the unwashed laundry! Vital personal details on Juan Anderson Hernandez have eluded me since I began my research. Finding the right documentation is difficult without knowing the dates and places. But today was another “Eureka!” day for me. 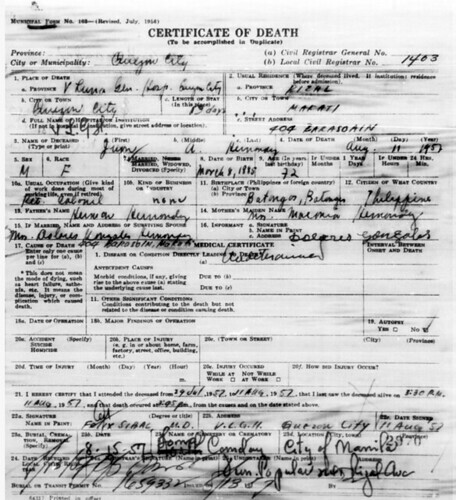 Thanks to the new familysearch.org’s indexed microfilm rolls and streamlined search, I was able to find my great-grandfather’s death certificate, riddled with names, dates and other details previously unknown to our family. 1. Juan A. Hernandez was born on 8 March 1885 in Batangas, Batangas, according to his death certificate. This location is not consistent with oral histories and the mini-bio we found here. From what was previously known to me, he was born in Lipa, Batangas. 2. His parents were Herman Hernandez and Maria Macaria Hernandez. According to my aunt, his mother was a woman of American-Mexican descent with the maiden name Anderson. As Juan was born in 1885 (well before the Spanish-American War which resulted in the influx of Americans into the country), it would be interesting to find out what brought his foreign mother/grandparents to the Philippines. 3. His last partner was Dolores Gonzales-Hernandez. They lived in 404 Barasoin St., Makati, which was in the province of Rizal at the time of his death. Their home is in the south of the Sta. Ana Racetrack where Juan worked as a steward. Interestingly enough, a street to the north east of the race track was named after him. 4. According to my dad, Juan left ex-President Quirino’s home on Novaliches to go to V. Luna General Hospital in Quezon City. He came in for a check-up and accidentally slipped and hit his head, as he was getting off the examination bed. On the document, we can see Juan was confined on 29 July 1957; and was attended to by Dr. Felix Sibal. After 19 days of confinement, Juan passed away on 11 August 1957 at 3:45 pm. He was 72 years old. While his obituary reads that he died from a heart attack, his death certificate states that the condition directly leading to death is “undetermined”. No autopsy or investigation followed. 5. Juan’s wake was at the Funeraria Popular along 2139 Rizal Avenue, Manila. He was finally laid to rest on 15 August 1957 at the La Loma Cemetery, also called North Cemetery, in the city of Manila. According to family stories, Juan Anderson Hernandez was a decorated soldier even before World War II. The undated obituary clipping my aunt sent me alludes to a connection to President Quezon and the Philippine Senate. My dad recalls, with much regret, that some of his military memorabilia were sold off by older relatives after his death. So our side of the family has very little information on him — only the tales from my Dad, my uncles and my aunts, exchanged over the dinner table. My earlier attempts to find Juan in written records have proven futile. Until today. Assisting the Senate as Sergeant at Arms was Juan Anderson Hernandez. He was born in Lipa, Batangas in 1885. 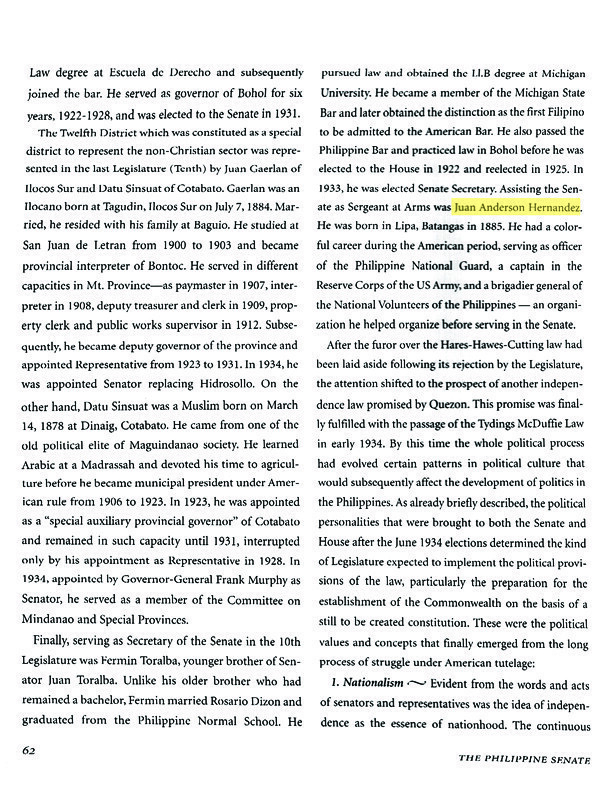 He had a colorful career during the American period, serving as officer of the Philippine National Guard, a captain in the Reserve Corps of the US Army, and a brigadier general of the National Volunteers of the Philippines — an organization he helped organize before serving in the Senate. Need I spell it out? Eureka! Juan Anderson Hernandez is my great-grandfather and one of the “dead ends” in my genealogy study. I penned an article about him in 2005, documenting all I had been told of his colorful life. 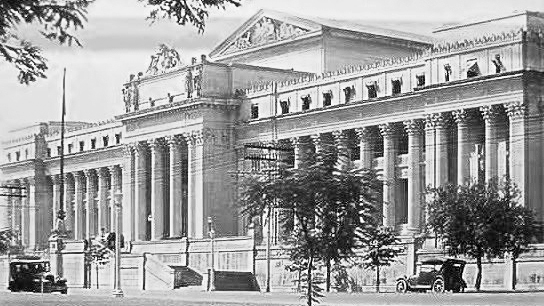 Among the details I have been trying to look into is my dad’s memory of him being a Superintendent or Commandant of the Philippine Constabulary School, the precursor of the Philippine Military Academy, headquartered at the Cuartel De Santa Lucia (Santa Lucia Barracks) in Intramuros, during the Japanese occupation. My dad remembers how his father, Segundino Magno, was given a job as a school cook by his father-in-law Juan. There is a sense of family pride in the lore that Segundino unlocked the armory at night for the guerillas to loot — his tiny contribution to the war effort. On the flip side, Juan was supposedly tried after the war, together with Laurel and other leaders, for his complicity to the Japanese invaders. So much data to verify! I need materials that will collaborate the oral histories. So off I went to the National Library of the Philippines in TM Kalaw St. Manila today. Third Lieutenant Jose V. Agdamag. Third Lieutenant Maxon S. Lough. 2. The station of the Constabulary School is changed from Santa Lucia Barracks, Manila to Baguio, Benguet. Santa Lucia Barracks will be used as a station for general service companies and band, quarters for unmarried officers on duty in the city, and casuals. Detachments from the provinces heretofore directed to report to the adjustant of the Constabulary School will hereafter be ordered to report to the commanding officerm Santa Lucia Barracks, Manila. The supply officer and supply sergeant of the Constabulary School is discontinued. Such supplies and property pertains to the school as are considered necessary by the Chief Supply Officer will be shipped to Baguio in time to be available for the term beginning September 1, 1908. Upon completion of business pertaining to this transfer, officers and employees of the school will proceed by first available transportation to Baguio for duty. The travel enjoined is necessary for public service (21808-G). From this, I confirmed what is written on the historial marker at the ruins of the Sta. Lucia Barracks — that the precursor of the PMA moved to Baguio in 1908, a good 35 years before World War II. Combine this tidbit and the confirmation from PMA that Juan’s name does not appear on the list of PMA superintendents, of Corps of Professors and of Commandants of Cadets, I am ready to disprove one of the family myths and conclude that Juan was never part of that organization. In an effort to deal with the guerillas, who were passing from nuisance to menace, the Japanese organized a new Philippine Constabulary. This body should not be confused with the old prewar Constabulary which, along with the Philippine army and Philippine Scouts, had been closely linked to the American army. The new Constabulary was composed, in part, of civilian volunteers and of men who simply needed jobs to feed their families. The core of it, though, consisted of Filipino prisoners taken after the fall of Bataan and Corregidor. These men were gradually released by the Japanese with the proviso that they join the new Constabulary. Nominally, there were then to perform ordinary police duties. Actually, the Japanese planned to train them to become a new army to help defend the Philippines against a possible future American attack. The commander of the new Constabulary was General Guillermo Francisco, a Filipino officer who had served in Bataan and whom the Japanese put though a de-Americanization program before his “promotion”. So, it seems that my great-grandfather’s Constabulary was Japanese-run and was not part of the Philippine military. My search for details on Juan continues. Philip Dudley Cezar is one of the seven children of David Francisco Cezar and Rebecca Dudley. Naturally gifted in basketball, the young Philip and his four brothers could easily best older neighborhood kids in the sport. Philip played with the varsity team of Fort Bonifacio High School, and eventually, Jose Rizal College (now University). Playing beside his brother David, Philip led the JRC Heavy Bombers in their 1972 National Collegiate Athletic Association Championship and was named the NCAA Seniors’ Most Valuable Player that year. 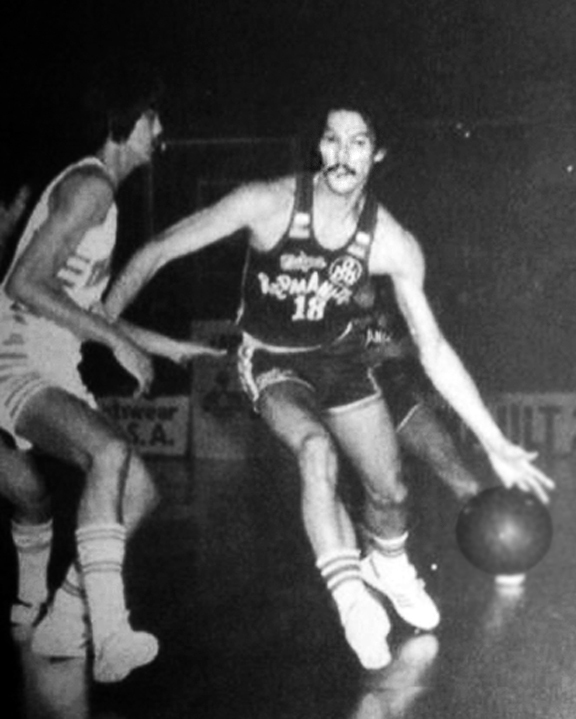 In 1974, Philip Cezar began his career in professional basketball with the Crispa Redmanizers. 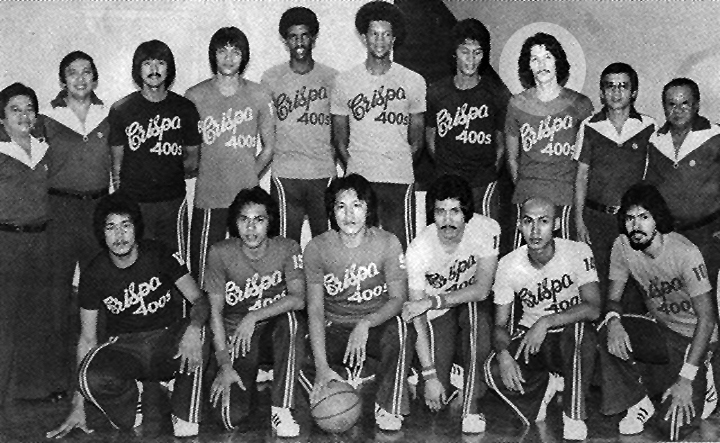 Finding the perfect mix of veteran players and fresh collegians, Crispa won the 1974 MICAA summer championship. He was named to the RP National Team which placed 4th in the 1974 Tehran Asian Games. Philip saw the birth of the Philippine Basketball Association and continued to shine as a professional cager. 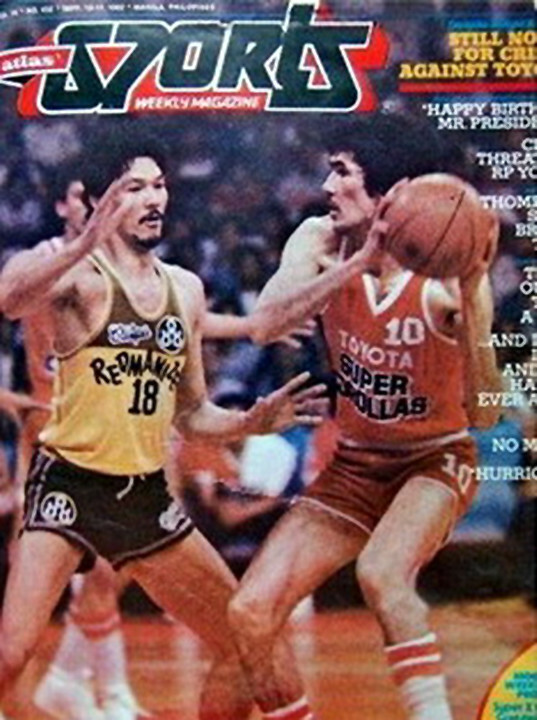 He was named PBA MVP in 1980. Over the years, Philip earned many nicknames that speak on his on-court strengths: “Mr. 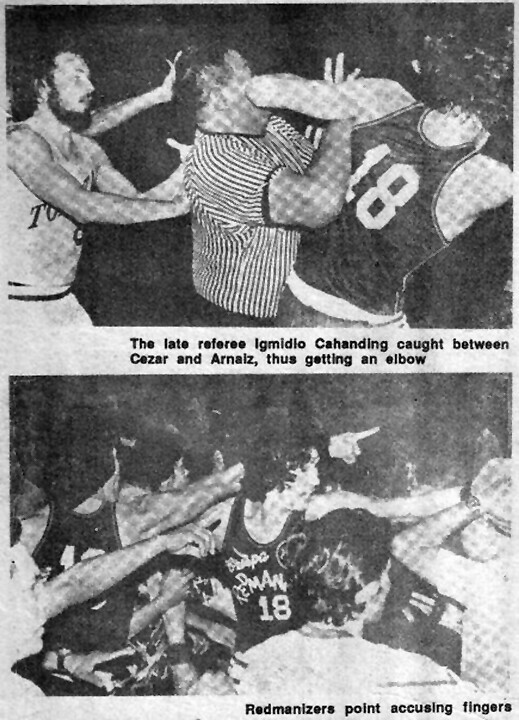 Scholar” (he was considered the best “thinking” power forward in the history of the PBA), “Tapal King” (he had long hands that served him well as one of the best defensive players of the league). In 1990, Philip retired from the game with 12,077 points which secures him a spot as one of the Top 10 all-time PBA scorers. As a coach, he served as second-in-command to once-rival Robert Jaworski — the head coach of Ginebra San Miguel in the 1990s. In 2000, he coached the San Juan Knights to a championship in the now defunct Metropolitan Basketball Association. In 2004, he was named commissioner of the Universities and Colleges Athletic Association for its third season. In 2005, he accepted the job as the new head coach of the Philippine School of Business Administration basketball team. 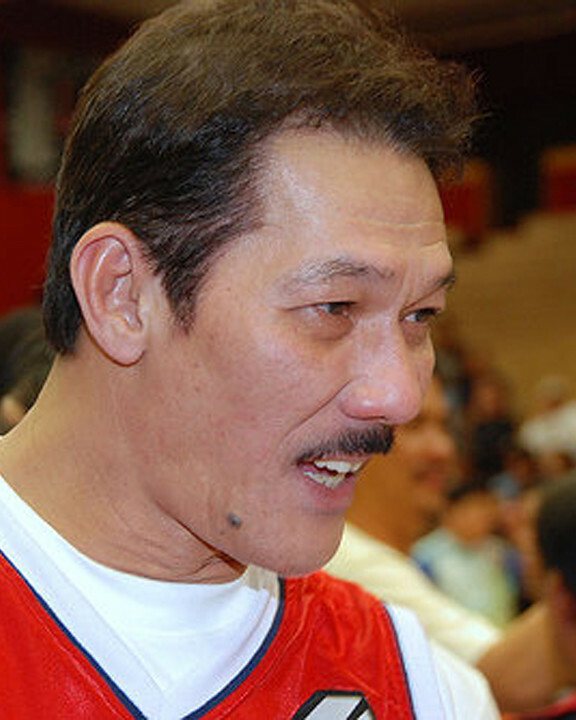 In 2005, he was among the twelve initial inductees to the PBA Hall of Fame. Philip also served the city of San Juan for many years as Vice Mayor, together with Mayor Jinggoy Estrada. Philip married an Ilokana lass, April Sanidad. His son Paolo Cezar has also taken to the sport — having played with the Benilde Juniors team. Jose Isaac Hernandez was born in Macabebe, Pampanga to Nicolas Anderson Hernandez, a bookkeeper or tinidor de libro for Ayala y Compañia, the precursor of the Ayala Corporation. Jose was an entrepreneur with a knack for mechanics. After the war, he collected spare parts and surplus engines from M-38 jeeps and Chevy trucks abandoned by the US Forces in the Far East (USAFE), intending to assemble a delivery truck for his family‘s rice-corn-vegetables-laundry soap business. When his design was completed by the Chinese Po Chuan, it was evident that the the low-profile jardinera bus would be best used for transporting people, not merchandise. 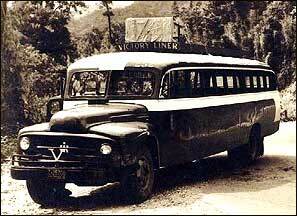 Inspired by a popular term “Victory Joe” and the fact that his nick name was “Joe”, Jose decided to name his post-war enterprise, Victory Liner. The business started with Jose Hernandez as the bus driver, his wife Marta Dayao Trinidad as treasurer, his in-law Leonardo Dayao Trinidad as conductor, another in-law Santiago Crisostomo (the husband of Marta’s sister Felipa) as relief driver and another in-law Eugenio Dayao Trinidad as helper. 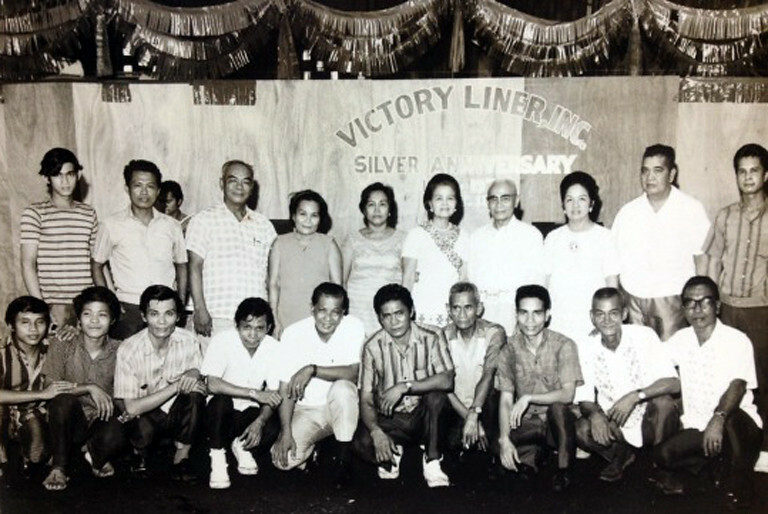 On 15 On October 1945, Jose drove Victory Liner’s first Manila-Olongapo-Manila run. Over the years, Jose’s company pioneered the converson of front engine buses to steel bodied, the use of diesel fuel, the use of automatic transmission engines, in-transit entertainment, among many. Victory Liner is one of the largest provincial bus companies operating in the Philippines today. Jose and Marta (center, standing) with their employees in 1970. Eduardo Alvir Pacheco was born on 04 January 1936. He married an Hernandez clan member, Maria Lourdes H. Marqueta. A competitive athlete since his youth, he played varsity basketball and football for San Beda College and the University of Sto. Tomas in the 1950s. Eddie was a member of the RP Football team to the Asian Games in 1954 and in 1958 and the Asian World Cup in 1963. Eddie was voted the most outstanding basketball player in 1962 by the Philippine Sportswriters Association (PSA), and was nicknamed “Mr. Basketball” (and “Mr. Football”). He was part of the RP National Basketball Team that competed at the 1960 Rome (finished 11th of 16 teams) and 1964 Tokyo Olympics (6th place). He was also on the team that represented the country in the 1961 Asian Basketball Confederation Championship, the 1962 Asian Games in Jakarta (Gold Medal), the 1963 World Basketball Championships in Manila and the 1966 Asian Basketball Conference in Taiwan. 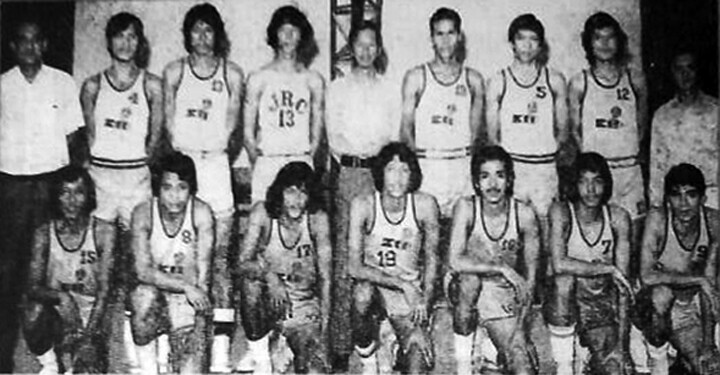 In the late 1960s, Eddie played jersey number 6 for the YCO Red Painters, a charter team that played in the Manila Industrial and Commercial Athletic Association. 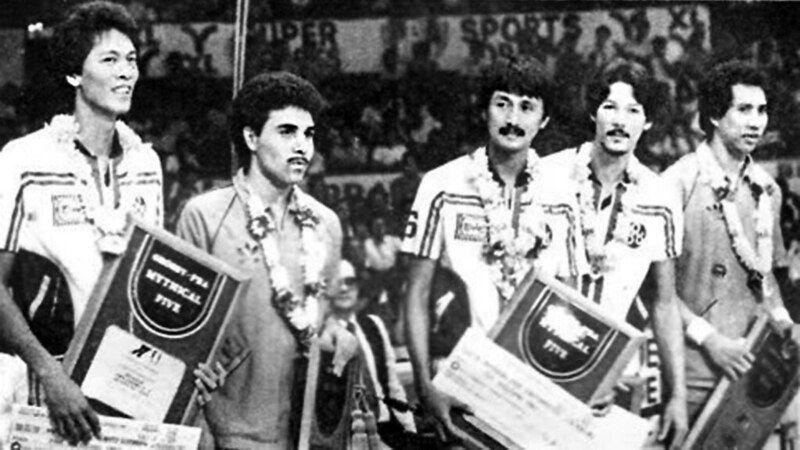 The MICAA was the forerunner of the Philippine Basketball Association, the country’s professional basketball league. Eddie continued to be active in Philippine sports long after his playing days, as one of the longest-serving consultants of the Philippine Sports Commission (PSC). As a football star player and pioneer of the sport in the country, Eddie received a special achievement award from the Philippine Football Federation in 2007. He passed away on 09 December 2009, after an apparent heart attack, at age 73. He was among the late sports greats honored by the Philippine Sports Association in their annual awards night in 01 March 2010.